This page allows a Citizen of the United Kingdom to purchase a Single Entry Minor Visa for Angola. Visa Type: Single Entry Minor Visa Travellers under the age of 18 at the point of travel may require a Minor Visa as opposed to a regular Tourist Visa. Please refer to the document list at the bottom of the page for details of whether this will relate to your travel. If not, you should request a Tourist Visa. A Single Entry Visa to Angola will allow entry to the country on one occasion for up to the maximum stay within the validity period. Re-entry is not allowed. If you need the ability to return to the country within the same validity period you should choose a different visa type. 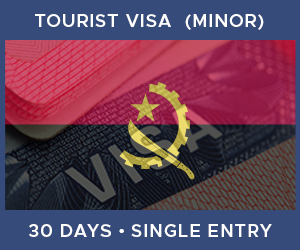 In order to apply for an Angola Minor Visa you will need to supply a number of items. Click on any of the icons below to learn more about each one.